What are the Major Causes of Car Accidents in Nevada? Motor vehicle accidents are unfortunately frequent in Nevada. In 2014, traffic accidents were responsible for causing almost 300 deaths and over 1200 serious injuries. In 2015, there was a 10% increase in the number of motor vehicle accidents, resulting in 321 deaths. Driver negligence is often a root cause of motor vehicle accidents. Failure to yield the right-of-way: There are many traffic situations in which a driver of a motor vehicle is supposed to yield the right-of-way to other roadway users. For instance, drivers often yield the right-of-way to other drivers, motorcyclists, bicyclists, and pedestrians. Inattentive driving: Drivers can sometimes be inattentive behind the wheel. Drivers might be texting or making calls on a cell phone (which is illegal), eating or drinking; or distracted by children, passengers, or pets that are in the vehicle with them. When drivers are behind the wheel, they need to devote their attention to operating their vehicles safely. When drivers are distracted, people get hurt. Reckless driving: Some drivers operate their vehicles at unsafe speeds, change lanes too quickly, follow other vehicles too closely, or just generally operate their vehicles in a careless, reckless manner. Disregard for the safety of others while driving is reprehensible, and results in injury and liability. Failure to obey traffic signs and signals: Running stop signs and traffic lights is a major cause of motor vehicle accidents in Nevada. For whatever reason, negligent and careless drivers sometimes think that signs and signals do not apply to them, and they will put others at risk by ignoring them. This can be immensely dangerous behavior and is a major cause of motor vehicle accidents in Nevada. Failure to maintain a lane: A driver might purposely change lanes quickly while leaving too little room between vehicles to safely make a lane change. Alternatively, a driver might be inattentive at the wheel and could drift into another lane or into oncoming traffic. Failure to maintain a lane is a main cause of serious motor vehicle accidents in Nevada. Anyone who is a victim in a car accident needs to speak with an experienced personal injury lawyer as soon as possible to discuss his or her legal options. When you are injured by a negligent driver, you are likely entitled to financial compensation for your injuries, medical expenses, lost wages, and potentially more. Choose a personal injury lawyer who has experience handling automobile accident claims. 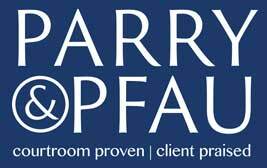 If you or a loved one has been involved in a motor vehicle accident in Nevada, contact the team at Parry & Pfau for a free initial consultation concerning your personal injury claim. Older PostIs it Legal to Change Your Name?